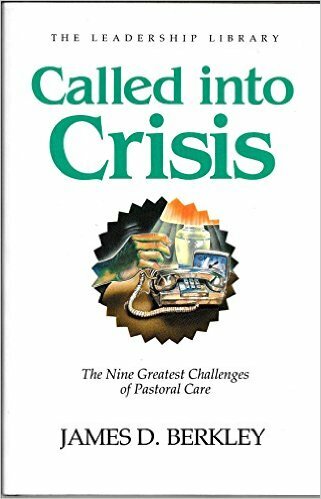 I've been working through James D. Berkley's Called into Crisis: The Nine Greatest Challenges of Pastoral Care (Carol Stream, IL; Dallas, TX: Christianity Today; Word Books, 1989). At the end of each chapter is a "Quick Scan" section where a minister can quickly consult some considerations when facing a pastoral crisis. Here are the considerations from the book when a minister needs to help a couple facing a marital crisis. 1. Assess the potential for physical assault. Should one of the spouses leave the premises? Might you be in danger when you intervene? If so, call the police. 2. Decide whether to wait to be asked to help or to take the initiative. Waiting may make you more effective, but it can also allow a situation to move beyond redemption. 1. Emotions will be high. Expect tears and anger. Emotions need to be vented in a controlled situation. 2. Two people, and usually a vast supporting cast, have caused this conflict. Rarely is there a true villain and victim. There are normally two sides to the story, both of which need to be heard. 3. Resolution of the problem will likely be a long process. For months and years they have built to this crisis; a snap resolution seems improbable. Crisis counseling can help them move from destructive to constructive modes of relating. 4. Your role is to open lines of communication, to help the couple hear and understand each other, to “translate” misunderstood communication and draw out the unspoken. 5. As long as each person’s focus is on what the other ought to do, the conflict will continue. When the focus turns to “what I can do to make my marriage work,” healing can begin. 1. Provide the opportunity for the controlled release of emotions, but disallow hurtful or spiteful attacks. 2. Let both parties know you are neutral. At some time talk separately with each person to get his or her unedited version. 3. Provide understanding of the issues involved. Point out options other than the drastic ones the couple may be considering, and help the couple work through those options. 4. Encourage the couple to talk with each other rather than at or about each other. Have them voice the things they would appreciate instead of saying what they don’t like. 5. Remind them of the covenant they made with God on their wedding day and help them rebuild their marriage around self-giving agape love rather than self-seeking feelings or expectations. 6. For those already divorced, help them rebuild their spiritual, emotional, and family lives with the loving care and Christian standards of the church supporting them. 1. Resist the urge to designate villains and victims or to take sides. Although fault may not be equal, it takes two people to make a marriage crisis. 2. Do not assume the responsibility to patch up the marriage. Only the couple can rebuild their relationship. 3. Do not condemn. People with faltering or fallen marriages know their failures and are loaded with guilt. 4. Do not underestimate the potential for violence in a domestic quarrel. Use caution entering a marital fight in progress. 5. Be cautious of unhealthy attractions or dependencies that can form between you and a counselee.